When you’re running out of room on your Windows 8 tablet to plug in USB accessories, Bluetooth is your friend. Bluetooth works much like Wi-Fi, but it specializes in connecting gadgets that live less than ten feet apart. If you add a Bluetooth mouse and Bluetooth keyboard to your tablet, it’s USB port remains free for other items. Bluetooth can also link your tablet with some cellphones to provide Internet access. Turn on your Bluetooth device and, if necessary, make it discoverable. Most Bluetooth devices include an Off switch to save power. Sometimes turning it on is as simple as flipping an On/Off switch; others sense movement, automatically turning on and off when needed. Making a device discoverable makes it available to be detected by a computer, usually for a period of 30 seconds. Some devices automatically become discoverable when turned on. Others make you press a button until their light begins blinking. Fetch the Charms bar by sliding your finger inward from the screen’s right edge. 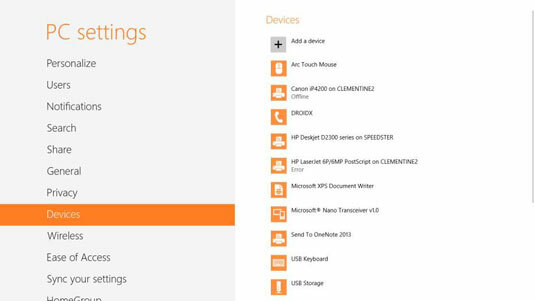 Tap the Settings icon to fetch the Settings pane; then tap the words Change PC Settings. The Start screen’s PC Settings screen appears. From the Devices category, tap the Add a Device icon. The PC Settings’ Devices screen appears listing all of your tablet’s recognized devices, whether they’re currently plugged in or not. When you tap the Add a Device icon, your computer begins searching for adjacent Bluetooth devices that are in “discoverable” mode. When your Bluetooth device’s name appears in the Devices list, tap the device’s name so Windows knows to connect to it. Type your device’s code if necessary and, if asked, click the Pair button. Everything usually works pretty smoothly until Step 5, where Bluetooth’s security measures kick in. Windows needs you to prove that you’re controlling both your computer and your Bluetooth device, and that you’re not somebody sitting three rows back on the bus trying to break in. To clear that security hurdle, different Bluetooth devices offer slightly different tactics. Sometimes you need to type a passcode — a secret string of numbers — into both your device and your computer. (Pull out the device’s manual to find the passcode.) Adding to the tension, if you don’t type in the passcode quickly enough, both gadgets stop waiting, forcing you to start over. Some Bluetooth gadgets let you press and hold a little push button at this step, proving you’re holding it in your hand. When in doubt, type 0000 on your tablet’s keyboard. That’s often recognized as a universal passcode for frustrated owners of Bluetooth devices who are trying to connect their gadgets. Once your new gadget successfully pairs with your tablet, its name and icon appear in the Devices category of the PC Settings screen. To remove a device shown in the Devices list, tap its name; then tap the minus sign that appears to the right of its name. Finally, tap the Remove button that appears.